I love Egyptology... I am a nut and when I discovered that the old documentary series, the Faces of Tutankhamun was released on DVD, I was ecstatic. Who better to review a DVD on ancient Egypt than someone who finds the subject fascinating and with the neutral opinion of impulsegamer. Originally, the Faces of Tutankhamun was aired in Australia during the 1990's that stars the delightful and quite British Christopher Frayling who not only takes us through the life of the boy king but also Howard Carter to give us a full picture of how these two lives are forever irrevocably linked. The first episode takes us through the early life of Howard Carter and how this sickly boy grew a fondness for this ancient culture. Originally a draftsman while in Egypt, Howard soon found him under the tutelage of one of the modern founding fathers of archeology that assisted Carter become one of the most famous archeologists of all time. The series gives the reader interesting facts about Carter such as how this semi-British aristocrat preferred the companionship of modern Egyptians thanks his European counterparts. All the clues of Carter's greatest discovery are slowly pieced together such as finding the name of Tutankhamun to eventually unleashing this ancient tomb, almost untouched since the young boys death. The other documentaries focus on the opening of this tomb, the history of Tutankhamun and also the famous curse that plagued this discovery that puts scientific fact behind the superstition. 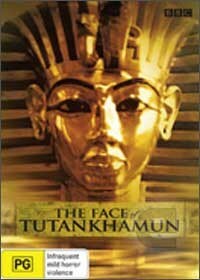 Unlike some dry documentaries that give too much information to the viewer, the Faces of Tutankhamun showcases this information in an entertaining way and give a variety of interesting titbits such as how the Europeans use to purchase mummies in order to display these ancient corpses at dinner parties. The only drawback to this DVD is the video and audio quality, however with so much ancient Egyptian goodness, there is little to complain. Highly Recommended!